Do you teach foreign language in your homeschool? I have attempted to teach Spanish every year and then add in Latin by 4th grade for each of my kids. Honesty moment: It’s really challenging! To teach a foreign language, it really needs to be reviewed and practiced every day. There needs to be grammar and vocabulary learning as well as practice reading and speaking the language. Oh this is so difficult when you have multiple children and are trying to learn the language alongside your children. That’s why I decided to outsource Spanish for my oldest child (6th grade) this school year. 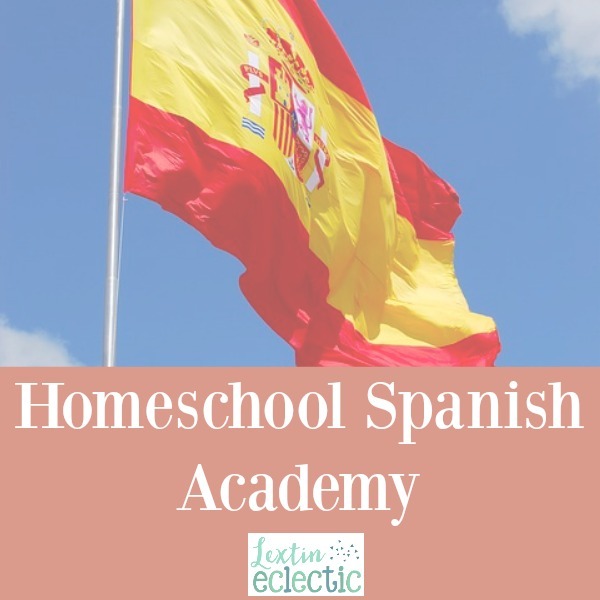 We found Homeschool Spanish Academy and we couldn’t be happier. I thought I would share our experiences in case anyone else is looking for some new foreign language options. So, if you’ve wondered how the lessons work, you’re in the right place! Read on for an explanation of how Homeschool Spanish Academy works! The Early Development classes are for ages 5-7 and are only 25 minutes long. These lessons focus on learning new vocabulary and practicing simple conversational skills. Stories, songs, and videos are used to keep the lessons engaging. Spanish for Kids is for ages 8-10 and classes are 25 minutes. Students practice conversing with a teacher and play games and do activities together to learn the language. The Middle School program is for ages 11-13 and these classes are 50 minutes. This level incorporates more worksheets and grammar exercises as well as conversation practice. The High School program can be used for high school credit if a student takes 50 minute classes twice a week. At this level grammar, reading, writing, speaking, and comprehension are emphasized as the student works toward fluency. The Adult Learner program is for any adult who wants to achieve fluency. The classes are tailored to each individual’s level and are geared to help with language skills that would be necessary in a career in various fields. Classes can be purchased in bundles of 15, 30, or 60 classes. For younger learners the classes are 25 minutes, while the classes for the middle school and above are 50 minutes. Once you have chosen your level and purchased a bundle of classes, you can schedule the classes. With this program you are paired with a teacher who is a native Spanish speaker. You are able to look at the available teachers and chose a teacher. Or you can simply choose a day and time that works for you and see which teacher is available at that time. Students are able to try out a variety of teachers in order to find one that is the best fit for them. Some students prefer to stay with one teacher throughout the classes; while others enjoy conversing with a variety of teachers. At Homeschool Spanish Academy you are able to choose your teacher and class time – and it doesn’t have to be the same teacher or even same day or time each week. For each class that you purchased, you will select a teacher and a day and time for the class. The program uses Google hangouts. So on the day of class, you will be sent a link to access the classroom. Note – It’s really helpful to have a computer with a built-in webcam as well as a headset with a microphone. For the first class, the teacher will assess your child and see what words and phrases they know and can say. The first part of class will be spent making introductions and making sure the child is comfortable. Then the teacher will begin the lesson with conversation about the vocabulary. The teacher shares his or her screen with the child so they can read the pages or do games together. Throughout the lesson, the child is encouraged to speak and answer in Spanish as much as possible. At the end of the first class, the teacher will want to speak with a parent to give you an update on how your child did and where they placed in the program. As a parent you will get an overview of expectations and have the chance to ask questions. Periodically throughout the program you will have short parent/teacher conferences so you can get updates on your child’s progress and ask questions. Older students are often assigned homework that is emailed to them (and is also available in the member portal of Homeschool Spanish Academy). The homework is several pages of a PDF. The child is able to type directly into the PDF, save the work, and then upload the files to be graded by the teacher. If you’re looking for a way to outsource Spanish or even a way to give your child hours of conversational Spanish practice, be sure to check out this program. I plan to write a review of our experiences with the middle school level soon, so be watching for that! However, I will say that we are really enjoying the program. My daughter has loved the teachers that she has met and she has chosen a couple that are favorites and prefers to take most of her classes with them. She has really enjoyed the conversations she has had with the teachers and is getting great Spanish practice!